The gas pressure washer is the classic tool for a homeowner. These high-powered machines can blast through dirt, mold, and stains to restore the look of a patio or deck. They’ll also quickly clean a driveway, wash your vehicles, and even clean your siding if necessary. If you’re ready to start cleaning your surfaces in a faster and more hygienic manner, then you’re ready for a pressure washer that can meet all your needs. In order to find the best equipment, you’ll need access to the best information. The chart below can help you quickly begin the process of finding the perfect gas pressure washer to meet your needs. What Are The Advantages of Using the Best Gas Pressure Washer? Gas pressure washers are all about strength. Electrical pressure washers might make less of an environmental impact, but you will spend forever trying to clean a deck with one. Some high PSI gas pressure washers will allow you to clean at triple of the best high-powered electrical models. When you’ve got a large driveway or patio to clean, that’s the difference between a couple of hours and a weekend project. Gas pressure washers aren’t tied to an outlet either. They supply their own power source, which means you can take them virtually anywhere to start power washing. To make sure that you can wheel that beast where it needs to go, look for pressure washers that have wheels that won’t go flat and have some form of traction. The final advantage of using the best gas power washer is that you’ll be able to accomplish more work. This equipment can be used to prep surfaces for new paint, clean stains off of siding, or brighten the look of an aged wood deck. What Are The Problems of Gas Pressure Washers? There are many advantages to using a gas pressure washer, but there are certain challenges that you’re going to face as well. The #1 issue that users face is how to properly oil the engine and pump of the pressure washer. Pumps are usually shipped with oil in place, but engines are usually not. You generally need to place oil into the appropriate receptacle and then allow it to sit for at least a day. Then check to see how much oil has settled and add more. This typically means that the average brand new gas pressure washer isn’t going to be ready for use until 3 days after you’ve received it or brought it home. Gas pressure washers also need to be winterized and stabilized if they aren’t going to be used for a while. That means taking care of the fuel that is in the tank and managing oil levels. You may also need to prime certain engines periodically so that you’ll get a good cold start. The final challenge of gas pressure washers is that many of them have a pull start that doesn’t always want to start. You can manage this situation by adjusting the choke and priming the engine, but even that isn’t a guarantee. Sometimes it can take several pulls to cold start even the best gas pressure washers, so they may not be suitable for everyone. Quality equipment provides quality results. These first-hand results are critically important to the modern shopping process. Over 70% of all sales today originate from user reviews of products rather than old world authorities like Popular Mechanics. There are good pressure washers, great ones, and then there are the best gas power washers that will effectively meet your needs. Good ones are fine, but the best ones bring the most value to a home. Instead of wasting your money today on a pressure washer that could be dead in 3 years or less, consider investing into the best gas power washer that will provide you with at least a decade of dedicated service. That’s why having access to pressure washer reviews is so important today. With comprehensive reviews, you can get all of the facts that you need to make a legitimate shopping decision. This limits the surprises that happen when a product is unable to fulfil its perceived, promised value. That’s why websites like this one are such an essential place for a bookmark. You get the data you need, an honest look at the best gas pressure washers, and no pressure to purchase anything. 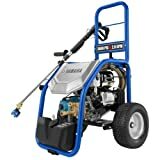 Are There Different Types of Gas Pressure Washers? 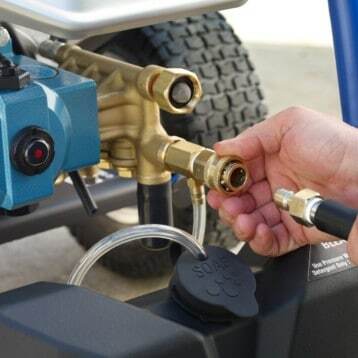 What sets different gas pressure washers apart from each other, aside from the PSI level that they’re rated to provide, are the features and options that are available. Some offer multiple wands that can help to enhance the pressure that can be provided at the nozzle. Others offer upgraded spray hoses that don’t kink or loop up and prevent good pressure from occurring. After determining what PSI level you need, the next step is to determine what features you’re going to need as well. Gas pressure washers can also vary on how much service time they provide on a full tank of fuel. If you are planning on having long sessions of service because there are huge areas that need to be cleaned, then look for the power washers that have the biggest gas tanks because you’ll get more working time, even if they burn fuel a little faster. 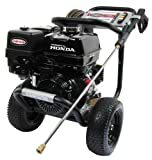 What Are The Prices of Gas Pressure Washers Today? Gas pressure washers are generally more expensive than their electrical counterparts. Entry-level gas equipment typically starts around the $150 mark on websites like Amazon. For commercial grade gas pressure washers, you may find a price tag that exceeds $1,000. The average household can get a medium duty pressure washer for about $300 that will meet most of their needs. For those who want a heavy-duty pressure washer, there is a 30% increase of the average cost. We really liked the quick click nozzle tips that come standard with the Generac 6596. A lot of pressure washers offer this as an option, but these four are the most useful. With 25, 40, and 0 degree nozzle tips and a specific soap applicator, you’ll be able to quickly clean even the toughest of spots with this pressure washer. Then you can switch over to a wider degree nozzle and gently clean other materials that are sensitive to higher pressures. Click here to view pricing on Amazon and find an awesome deal. 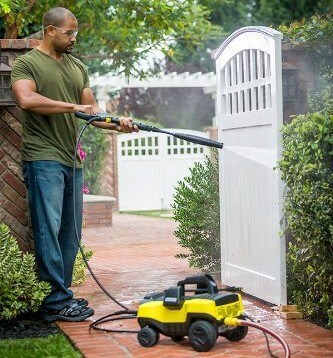 Strong enough for the shop, yet versatile enough to be used at home, this patent pending pressure washer offers a factory tested experience that will help you clean everything from house siding to lawn furniture. If you’re tired of scrubbing stuff clean with a bucket and a brush, then the Simpson MegaShot is a definite investment to consider. This pressure washer incorporates a downstream detergent injection system so that most compatible cleaners can be used with ease. Include the twist-on connectors for the water and spray hoses and it means you’ll get a good seal without a lot of fuss or hassle. We really loved the flexibility that comes with the Simpson PowerShot. 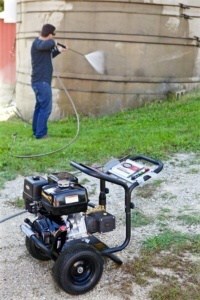 You don’t have to blast everything you own with 3200 PSI when you own this pressure washer. Using throttle adjustments, you can cut the pressure by 50% so that you can clean more sensitive items, such as your lawn furniture. The different nozzles also add to the customization of use that makes owning this pressure washer such a joy. The frame also has an advantage because it made from welded steel and a solid steel axle and steel engine plate, giving you added strength and stability. 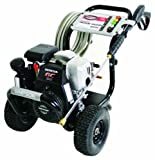 For this particular pressure washer, you’ll find that it is one of the best-priced models at this PSI level in the industry today. 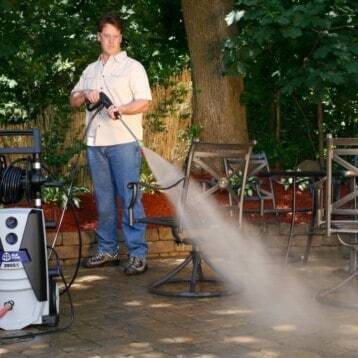 You’ll be able to use this pressure washer on any surface and be able to spray it clean. It’s perfect for extended concrete driveways, cleaning up sidewalks, or even blowing out a gutter that’s been filled up with seasonal debris. A 30-foot hose has been included so that you can accomplish most of your cleaning needs without needing to move the unit much. Everything on the Generac 6602 funnels through a central control panel – an advantage because all of your necessary adjustments are placed in one central location instead of all over the machine so you can get right to work. Not only is a 2 year warranty included with the Generac 6023, but this pressure washer also gives you the ability to adjust the level of PSI that you are applying at any given moment. This will allow you to be able to effectively clean without potentially damaging what is being cleaned. If you’ve ever seen the little splinters that can show up from a pressure washed deck, then you know how important PSI adjustments can be. 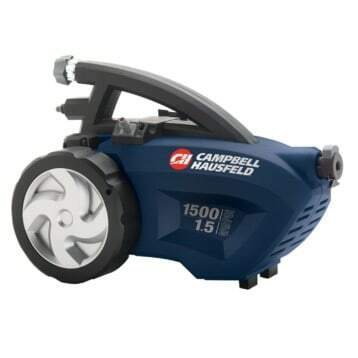 This is the perfect pressure washer for those who are looking for something that is strong enough to take some stains off their deck or driveway, but don’t necessarily want to peel the paint off of their garage. Even so, you’ll want to be careful when using this pressure washer on certain surfaces – especially painted garage floors. The 0 degree quick click nozzle provides a pretty sharp spray that can still take the paint off. There is even a .75 gallon detergent tank attached that allows you to keep your soap on the machine instead of separate, giving you the extra cleaning power you might need. If you’ve seen a lot of pressure washers, then you may have noticed that many of them have limited fuel storage in their design so that detergent tanks can also be included. Sometimes you can’t even put a full gallon of fuel into the pressure washer and that means a lot of stopping and starting. The Yamaha 3000 PSI has a massive fuel tank that will keep you working for hours at a time. You’ll save time and you’ll save on the cost of fuel since you won’t have to start it up all the time. 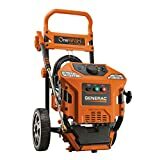 The first thing we noticed about this pressure washer was the change in its design from other Generac models. Instead of being tall and upright, the Generac 5993 is wide and compact. This makes it very suitable for transporting to a job site, even if on your own property, without having it move around or tip over. Commercial grade doesn’t just refer to the PSI output – everything that comes with this pressure washer is built to last. This is not the pressure washer for the average home. If you just want to wash your vehicles, clean your sidewalks, and maybe get rid of some deck stains, the Simpson PowerShot PS4240-S is overkill. Any pressure washer above 3300 PSI is not recommend for vehicles or even for power soaking. What you can do with this pressure washer, however, is eliminate stains, do paint prep, and clean away stubborn mold and mildew that can build up. 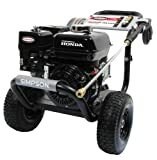 With the Honda engine taking the experience of using this pressure washer to a new dimension, users will find that it is relatively quiet for a gas-powered unit, offers a consistent performance, and it has been paired with industrial triplex plungers for an outstanding durability. The best gas pressure washer is just waiting for you today. Use all of these gas power washer reviews to your advantage and you’ll most certainly select the best equipment for your home today!